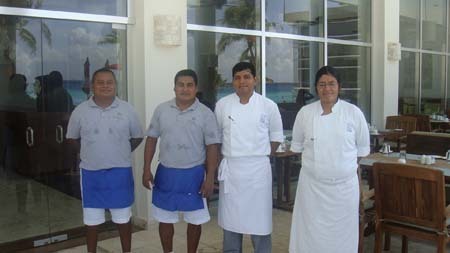 On June 21st, early in the morning all Sea Olive´s staff were ready to start operations and offer a warm welcome to guests and diners. This seaside restaurante offers dishes such as chicken breast marinated in lemon-garlic-ginger, grilled vegetables and baby potatoes; or Grilled Garlic Shrimps over parsley linguini with tomato and bell pepper. For additional comfort while dining it features an indoor air-conditioned section and an outdoor terrace, both a la carte. So, either for breakfast or lunch, it will be a pleasure for us to assist you while you enjoy your dishes, surrounded by a warm atmosphere and nice view. 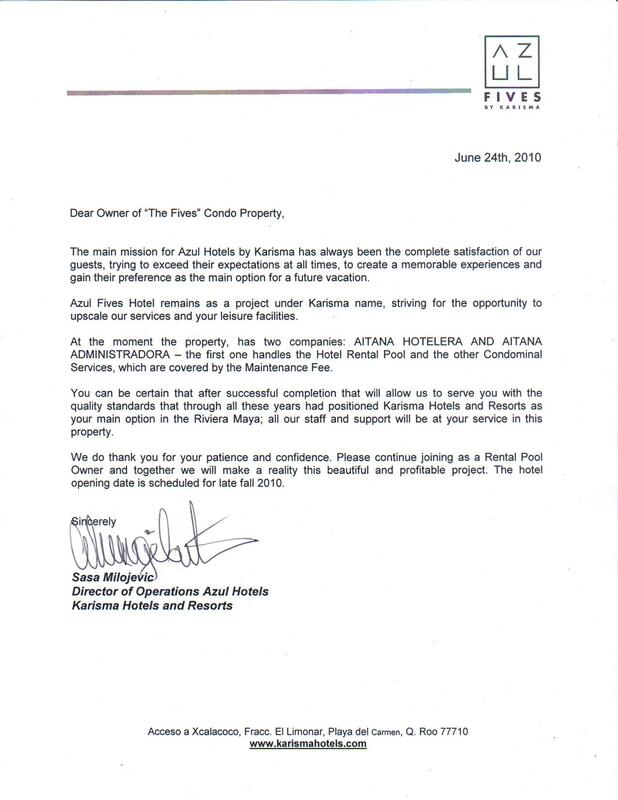 The following letter has been sent by the Director of Operations from Azul Hotels (from Karisma), in which expresses the full commitment to the Fives Project. We are programming the appointments to proceed to the signature of the Title Deeds from the 25th of June 2010. The Fives team will be in touch with the customers to fix the definitive date to sign the Deeds. TM Real Estate Group is the only owner of THE FIVES. It is a pleasure to inform you that last wednesday May 26 2010 TM Real Estate Group purchased all THE FIVES Project . Hope you like the news and some new information is coming in the next days as restaurant or pool bar of beach club opening or hotel opening. We have the pleasure to confirm you the following dates to sign the deeds at the Public Notary. Friday 27 of November 2009, Friday 4 December 2009 and Friday 11 december 2009. Thursday: Arrival to Cancun and THE FIVES team will pick you up and transfer and stay at THE FIVES. Friday: Meeting with client’s legal representant/lawyer and when all is clear drive to Notary Oficce. Sign the Deeds and then tranfer to THE FIVES. Saturday: Relax at THE FIVES or in Down Town Playa or at the beach. Sunday: Tranfer to Cancun Airport. For those clients that wish to stay longer period, please do not hesitate to coordinate with us. Please contact: Cesar Bernad or Ramon Grau. Please consider that after 15 December 2009 Notarys, register and legal oficces will not be full opening even closed and we will not be able to sign you the deeds untill after 10 January 2010. Greetigns and hope having soon news from you.